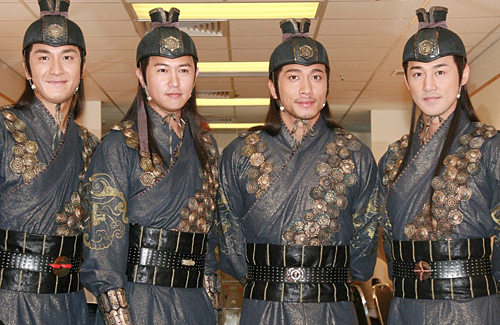 TVB series The Four <少年四大名捕> just reached its 10th anniversary since its broadcast date, and many viewers are rewatching the show to reminisce the popular martial arts drama. Starring Raymond Lam (林峯) as “Heartless”, Ron Ng (吳卓羲) as “Cold Blood “, Kenneth Ma (馬國明) as “Iron Fist”, and Sammul Chan (陳鍵鋒) “Chaser”, the four actors have moved on to their own respective paths. Surprisingly, it’s not Raymond Lam who is the most popular now. Back in the day, rumors had it that the four actors did not get along and that the other three would isolate Kenneth. However, that did not stop him from staying at TVB and becoming one of their top actors. Though Kenneth was given many lead roles throughout the years, TVB still hasn’t rewarded him with Best Actor in the annual TVB Anniversary Awards. Even last year, Kenneth was a strong contender for his role in The Exorcist’s Meter <降魔的> but lost to Vincent Wong (王浩信) and settled for My Favorite Male Character award. Ron worked for TVB for 13 years, but 3 years ago he decided it was time to move on. Switching to the Mainland Chinese entertainment industry, Ron was given many acting opportunities, which definitely secured his income. From his drama Why Get Married <結婚為什麼>, not only did he get paid over a 6-figure-sum per episode, but he was also able to buy property after 3 years. Recently, he filmed Shaw Brothers’ Flying Tiger <飛虎之潛行極戰> and its upcoming sequel. Similar to Ron, Raymond worked for TVB for 15 years before he decided to end his contract in 2014. He signed with EEG and focused on his singing career while filming several Mainland Chinese dramas, yet his career did not peak as expected. Originally, he was given lead roles in The Virtuous Queen of Han <衛子夫>, and Detectives and Doctors <陸小鳳與花滿樓>, but the reviews were only mediocre. Recently, he signed with Louis Koo’s (古天樂) entertainment company. He will be partnering with Jessica Hsuan (宣萱) in Louis’s $200 million HKD film Back to the Past <尋秦記>. Out of the four, Sammul was the first to leave TVB to expand in China. Filming over 20 dramas as the main lead, Sammul’s popularity is extremely high with over 5.88 million followers on Weibo. Sammul is best known for his role in Beauty’s Rival in Palace <美人心計> alongside actress Ruby Lin (林心如) in which he won Best Actor and Favorite Actor. After The Investiture of the Gods <封神英雄榜>, he was known as the most handsome “Jiang Ziya”. Sammul’s career definitely prospered after leaving TVB. 13 comments to “The Four” Reaches its 10th Anniversary, But Where Are “The Four” Now? It will only be a matter of time until Kenneth leaves for ‘greener’ pasture if he has any demand in the mainland. sadly I don’t think Kenneth’s style and look have much of a market in the mainland. When I reminisce I usually watch the ‘Five Tigers’ and not the ‘The Four’ lack of talent actors…. If you think The Four is lacking, TVB’s new generation of actors are even worse. I have not seen Sammul for a while. He doesn’t care about the HK entertainment industry. His career is in the mainland now. @anon I don’t follow mainland drama closely but those two drama mentioned since to be two of the very few productions he had since he shifted his focus. Maybe the good income enables him not to be constantly working like in tvb. I didn’t follow Sammul’s career much either after he moved his career to Mainland, but, I did occasionally check up his wikipedia page to see any new work from him that is worth checking out. He actually has steady work in mainland and participated in many series. They are just not the high profile series we always see on the news. He recently played Detective Dee in a movie. But, that movie has nothing to do with the Detective Dee series starring Carina Lau. It’s a different production with a different actress playing Empress Wu. It’s also true that he put importance in work life balance. So, he will take breaks in between work to do something else.